Many wives have contempt towards their husbands. I know since I used to have it towards my husband and I see many women having contempt towards their husbands by the way they treat them and talk about them. 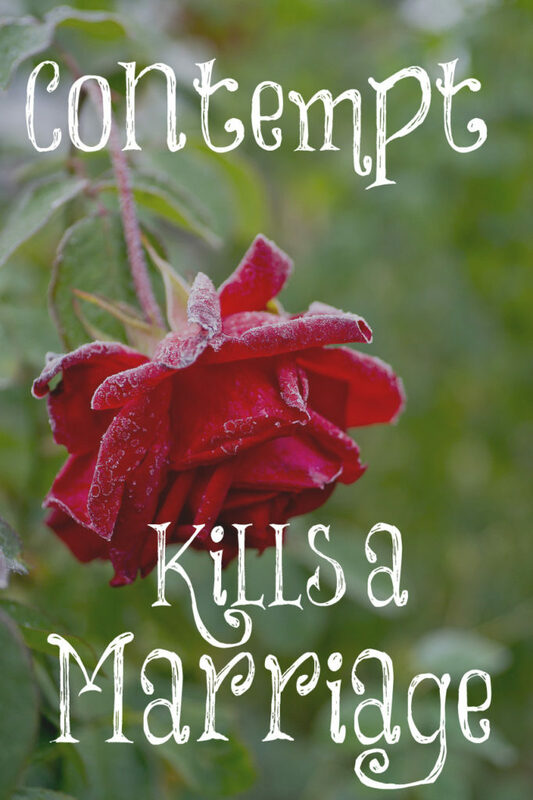 Contempt kills a marriage. What is contempt? According to the dictionary, it means “the feeling that a person or a thing is beneath consideration, worthless, or deserving scorn.” For some reason, it’s easy for us wives to feel that we are better than our husbands so we treat them badly. How pathetic and ungodly is this? The very definition of love is being patient and kind. Contempt also means “lack of respect or reverence for something.” God specifically commands wives to reverence their husbands since He knows how easy it is for us and our selfish pride to feel superior towards them. This is in direct rebellion to God’s will for us. The Pearls wrote an article for their 45 wedding anniversary and one of the things they have witnessed over their many years of mentoring couples is the destructive nature of contempt. “Contempt (the act of despising) toward your spouse is deadly. It takes the form of silence—withdrawal, bitterness, or negative remarks. It is what the Bible calls ‘constant drippings.’ Wives are more likely to be guilty of expressing contempt, although some husbands develop and even perfect the art to their own unhappy demise. No marriage can undergo a regular dose of contempt and survive. Contempt is like arsenic: it is toxic and guaranteed to bring death. The constant drippings might take years, but they drain a relationship of all joy and peace. “Resentment breeds contempt, whether the resentment springs from hurtful words, deeds undone, acts of selfishness, gross indiscretion, or any number of human failures. The key to remember is this: human failures are found in every marriage every single day. Even those who deem themselves the most perfect spouse are still given to human failures. How do we rid ourselves of showing contempt towards our husbands? We begin by actively choosing to love them by the way we treat them and the words we say to them. We immediately kick out any negative thoughts we have towards them. We show them kindness and grace. We are forgiving and merciful to them as our Heavenly Father is towards us. We confess our contempt towards them and ask for their forgiveness. We even ask them to hold us accountable if they ever sense we are disrespecting them in any way. This means we become vulnerable towards them which strengthens our marriages. Don’t allow contempt to destroy your marriage any longer. After 36 1/2 yrs of marriage, contempt is winning. I am dead tired of the mental manipulation. He tells me to get some friends and when I do, he criticizes and cuts them down. He blows up if I talk to anyone. It seems he wants to control everything I do. We need to help his ailing parents, but when I do he finds some reason to blow up over that. He can be the nicest guy when he’s in the mood and he usually acts very nicely around others. But when it’s just him and me, he flips. I know he’s probably an alcoholic. He says it’s only beer, but he drinks alone, most of the time he doesn’t seem too affected by it but some nights I can tell and he’s meaner than usual. I have always been here for him. We are self employed so we’re always together. I try to do things the way he wants but it’s getting harder to know what he wants because it always changes! And I have never talked about him to anyone because that would feel like betrayal. The only ones who know how things are, are our grown children because they saw it growing up. Yes I am growing bitter but I feel the life is being sucked out of me. I am losing interest in everything because, even though he tells me to get involved in things, I know he’ll turn it around on me. I have tried to be the wife in 1 Peter, I have pleaded with God over this. I am driven to the point where I don’t even care anymore. It sounds like you do need to get involved in things, mainly with godly women who you can gain encouragement and support from even if he turns it around on you. You can kindly remind him that he was the one who encouraged you. Pray for an older, godly woman who you can spend some time with. Are you in the Word daily and finding your strength from the Lord? For He promises that you can do all things through Christ who strengthens you. Am I betraying him if I talk to someone about him? He would be furious if he knew. When I remind him that he encouraged me to do things, he denies it. He’s like a Dr Jekyll/Mr Hyde. I walk on eggshells, determining his mood. Do I obey him when he doesn’t want me to help his mother who needs to get to the Dr? Do I continue to tell white lies to others about him, like he asks? You don’t necessarily have to speak badly about him to get encouragement and advice. You can simply tell an older, godly woman that you are struggling in your marriage. She can’t change your husband with any advice she gives but she can encourage you with your behavior and how you respond to him. The only time you should disobey your husband is if he asks you to do something evil or harmful so you must decide carefully if what he is asking you to do is one of these since God is clear in His Word that we are to be submissive and obey our husbands. I assume you have spoken to him about “not being nice to you.” Men sometimes need to define what they are doing, and I would suggest that you try to set up a “deal” with him and you are trying to please him, and all you would love to see from him is that he is “nice to you” in how he asks and speaks to you. If he is a good guy overall, he may respond to seeing his values of being “nice” to others violated. If he agrees to the game, ask him if you can gently say his name, and continue saying his name until he stops being mean or starts being nice. Imagine a wife who gives up her resentment and contempt, supports he husband tries to model for him what being nice looks like… an a husband willing to allow his wife to call his name out gently when he starts being “not nice.” It may take a while, and he won’t turn nice overnight, but if you can play your part it is very hard for a husband who believes he is a nice person overall, not to be “nice” to his wife… unless his own contempt drives deep. And in that case only winning him with your own love may allow the Lord to do His mighty work of change. Never give up! Remember, this is not about you, but about the Lord Jesus and your marriage. Find out from him is anything you are doing sets him off… and ask him to hold you accountable for not doing those things in ways that are always “nice,” not by getting upset or mean. We often do not realize how much hurt and pain we have caused our spouse over 36 years. Sure, he or she has caused us pain and frustration too, but to get to the heart of the matter, confessing ones own sins, and asking for forgiveness, and accountability to change those things, can go along way to begin to break down the resentment that stands at the door ready to spring back with unkind remarks and contempt. Yes thank you. I have tried talking to him and he understands what I’m saying. But he has to be in the right mood for this conversation. This is what I mean by Jekyll/Hyde. If he’s in his other mood, it goes nowhere, usually worse. So in his good mood, he says he’ll try, but that’s as far as it gets. I do suspect he has deep issues that he won’t talk about. I’ve asked him a few times if I’ve ever done anything to offend or hurt him. There’s only been a couple things he mentioned and I apologized and we talked them out. But I’m not giving up, even though I feel like it often. I just need to depend on the Lord day by day. I am so, so sorry to hear your story. Although you’ve been married for longer than I’ve been alive, I feel like I have been in a similar situation – my husband has acted like this in the past (due to addiction, mainly). I had to detach myself emotionally from my husband in order to preserve my sanity – the emotional abuse I endured nearly broke me. At a recent church convention we heard a LOT of things that I found encouraging, some of which I believe would be helpful to you. I won’t go into all of them here as it would take too long, but one thing was: God knows our situation. He may not change it – we may be in that situation for the rest of our lives, or we may not. But if we are, our power is in prayer. Through prayer, we can get the strength we need to endure. The world would tell you to leave him. And having been in an emotionally abusive marriage, I know how tempting it is. And to be honest, we did separate for a time, but our goal was always to get back together. But if you can do so, keep on enduring. If you would like to know more of what we heard, please feel free to ask Lori for my email address, and get in touch. I totally understand when you talk about detaching emotionally. It’s too difficult to be jerked around. Sometimes that’s the only way I can deal with it. It would be simple to show love to an abusive person who isn’t your spouse, because you can emotionally detach. But when it’s the person you are one with, it tears at your soul. Deep down, pretty sure I know that God is using this to conform me to his image but it’s so hard. Thank you for your thoughts. I am also sorry for what you have endure. Was your husband like this from the beginning or is is a recent change in his behavior? I had to think about that because we’ve been married so long. He definitely wasn’t like this when we were dating or I wouldn’t have married him. I think it has been gradual, much more noticeable now since our children are grown and our business isn’t as crazy as it used to be. We were so busy back then that we’d get up, work, and fall into bed at night. No time to deal with anything else. Maybe that was part of the problem; we didn’t have any time to work on our relationship in the midst of our business and homeschooling. It was 22 years before we were able to take a weekend off. Let me just say this, though. I have seen small answers to some of my prayers. I need to be very careful in how I handle certain situations. So I’m asking God for wisdom. I encourage you to buy Created to Be His Help Meet and read it often for encouragement and reminders. It’s a fantastic book! Yes Lori, I have had that book since it first came out and have re-read many parts of it. I actually saw a copy of the latest edition, which has a couple more chapters that really speak to my situation. Thank you all for your encouragement. sadly this is the norm in church ladies groups today. my own mother is constantly speaking in a cruel and disrespectful way about men and boys in general, even her own husband. the women in her group eat this up. Yes, it seems to be normal conversation among women today and it’s so destructive, Mary. Thankfully, you see it and know how harmful it can be. The saddest thing I have ever watched was couples (sadly both husbands and wives) showing contempt for each other; we had some friends in the earlier years of our marriage who lived like this and it was both sad and embarrassing to witness. Sadly I heard they did divorce in the end! Showing contempt to each other is not only a sin it is so harmful for the children who witness it, it bring devastation to all involved!